Last week, the University of New Brunswick signed a Memorandum of Understanding to collaborate with Mitacs on an international fellowship initiative, the Globalink Graduate Fellowship Program. As part of a full partner collaboration between UNB and Mitacs a number of Globalink Graduate Fellowships will be made available to UNB graduate students who took part in the Globalink program. "UNB is pleased to expand its relationship with Mitacs," said Eddy Campbell, president of UNB. "No fewer than 11 academic units on our campuses have benefited from the research support provided by Mitacs over the last few years. Programs like these nurture the innovators and entrepreneurs of tomorrow, and provide our students with valuable research opportunities." 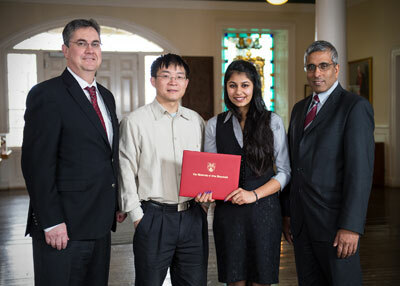 UNB's first Globalink Graduate Fellowship recipient is Ishneet Kaur, a master of chemical engineering student, whose research is focused on the pulp and paper industry, in particular in the integration of forest bio-refinery into the kraft pulping process. Ishneets’ supervisor is Yonghao Ni, the Director of UNB’s Limerick Pulp and Paper Centre.